Inlays and onlays are a restoration method used to treat mild to moderate decay. An inlay or onlay is typically recommended when the damage to your tooth is too extensive for a simple filling, but not severe enough to require a dental crown. Our team at Palmetto Family and Cosmetic Dentistry in Sumter, SC, offers tooth-colored inlays and onlays to restore the strength of your tooth without compromising the aesthetics of your smile. Using our advanced CEREC® technology, we can create durable ceramic inlays and onlays in our office to save you time and money. 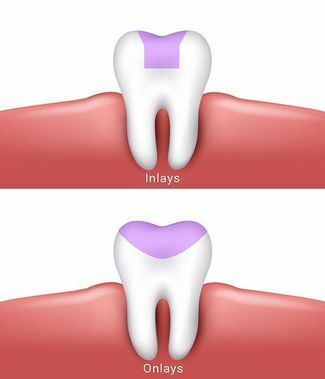 Inlays and onlays are a restorative treatment designed to repair damage to the molars. Custom-fabricated with dental ceramic, inlays and onlays can blend seamlessly with the color of your natural teeth for an aesthetically pleasing result. They can be used to repair teeth after damage or decay or to replace old metal fillings. A dental inlay is used when decay or damage affects the chewing surface of your tooth. Similar to fillings, inlays fit inside the top section of the tooth to replace small amounts of lost tooth structure. Also known as partial crowns, dental onlays treat more extensive damage than inlays. Onlays can be placed over the cusps of your tooth as well as the inner surface. The first step of your treatment with an inlay or onlay is preparing your tooth for placement. Your dentist will clean out your tooth by removing all areas of decay or damage. Then, we will take a digital impression of your tooth using CEREC. This technology also allows us to fabricate your inlay or onlay right in our office, eliminating the need for a temporary restoration and saving you time. With proper care, an inlay or onlay can last up to 30 years and can help prevent the need for more extensive treatment in the future. When your inlay or onlay is complete, your dentist will use a strong adhesive material to bond the ceramic to your tooth. Once in place, your dentist can check the fit and feel of your restoration and make any necessary adjustments. For some patients, a follow-up visit is necessary to achieve maximum comfort. Due to their custom fabrication, inlays and onlays are easier to clean than crowns and fillings, meaning bacteria is less likely to affect the area after treatment. They can also last much longer than conventional fillings. With proper care, an inlay or onlay can last up to 30 years and can help prevent the need for more extensive treatment in the future. A custom-fabricated inlay or onlay from Palmetto Family and Cosmetic Dentistry can restore the integrity of your tooth while maintaining the aesthetics of your smile. As a conservative alternative to dental crowns, inlays and onlays can help patients whose teeth are affected by mild to moderate decay or damage. For more information about inlays and onlays or the other forms of restorative dentistry we offer, contact our office online or call us at (803) 469-3555 (Tahoe office) or at (803) 773-5411 (Guignard office) today.